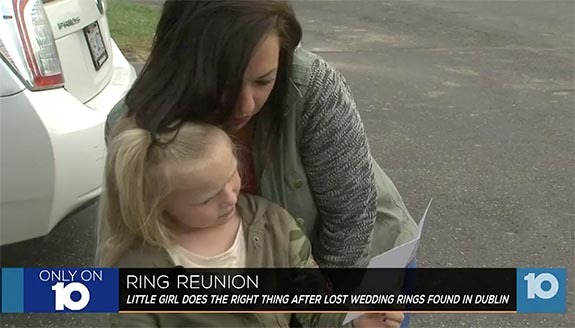 Six-year-old Alyah “Tiny” Dutton was sure the beautiful diamond rings she found in the restroom of Ballantrae Community Park in Dublin, Ohio, belonged to a magic princess and that they needed to be returned to her right away. Tiny had been enjoying an outing at the “bunny park” sprayground with family friend John Gerlach when she took a break to use the restroom and happened upon the diamond jewelry worth $10,000. She exited the bathroom and immediately revealed the treasures to John. 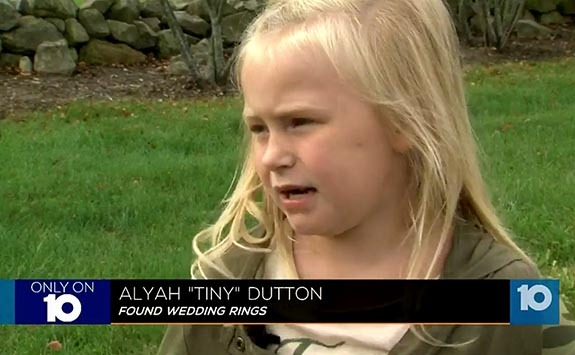 Tiny and John turned over the lost rings to Dublin Police Department. 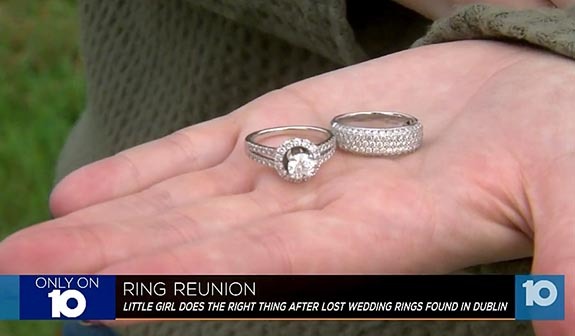 John, who is recovering from addiction, admitted that five years ago those rings would have ended up in the pawn shop. Today, he’s a new man. Earlier that same day, Caitlin Adkins was also enjoying her day at the park with her husband, Jake, and baby, Ari. Before applying sunscreen to the baby, she slipped off the bridal set and placed the rings into the front pocket of her jeans. Then she went into the ladies’ room to change into her bathing suit. 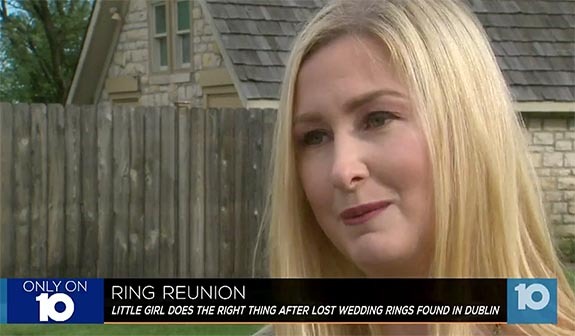 “I cried knowing I must’ve lost them at the park when I put my bathing suit on and thought about how special those rings were to me… not monetarily, but what they meant and their significance,” she wrote on Facebook. 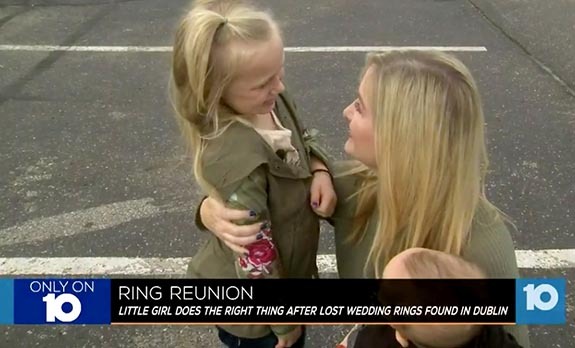 After being reunited with her rings, Caitlin arranged to meet with Tiny, John and Tiny’s mother so she could thank them in person. Tiny’s proud mom kissed the youngster on the head. “I love you,” she said. “Someone had a choice to do the same today, or not. They did. Thank you,” she wrote.